This photo was sent to me as "the end of the rainbow." But, how do you know that isn't the beginning? One of the comments I read about this photo said, "there is no pot of gold, so it must be the beginning." Others were much more negative. Either way... it is amazing. Something I never thought I would see... even in a photograph... even on the interwebz. Here's the link to the story about the picture. Wow- what a great photo! It's the beginning if you accept it as that, and those who don't or that may doubt that there's a pot of gold are never going to find what they don't want to see anyways. Let them be pessimistic and negative. We can toast it with a glass of champers. 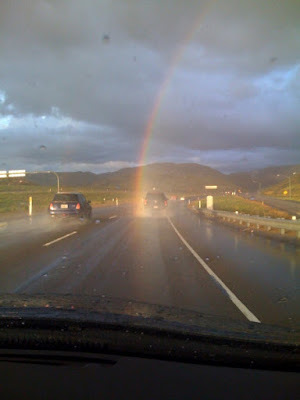 Everyone who drives through it is someone's "pot of gold". ok... that totally deserves an "awwwwwwwwwwwwwwwww"
best comment ever. *sigh* you made me all schmoopy.